Photo by Iwasaki Electric Co.,LTD. Roppongi. Tokyo 1989 Arc hills Mori building. 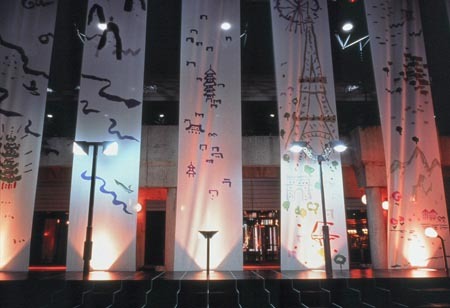 I made these tapestries as background for Exhibition of Outdoor lighting lamps designed by Mr. Masanori Umeda. They are paintings of landscapes from all over the world on 2m X 10m tapestries. Fabric presented by Kawashima Textile Co.,Ltd.